Bicycle Touring in the Berkshires | When I Survey . . .
It’s that time of year again when the ice is off the road, the bikes come out of the garage and we pull on our cycling shorts to find that once again they have shrunk over the winter. Here in the Berkshire Hills we have an active cycling club called the Berkshire Cycling Association, which organizes and sponsors a number of events, from road and mountain bike races to time trials. For those who prefer not to go so fast there is a also series of weekly touring rides beginning this week and continuing into September. The oldest of these rides is the venerable Thursday Night Ride, which has helped many a new rider to learn how to ride in a group. Ably led by Shaun Weigand the ride attracts 20 to 35 riders on any given Thursday night. The rides begin in different locations and over the course of the season cover most of Berkshire County, with an occasional foray into adjacent Vermont, New York, or Connecticut. A newer and smaller touring ride that meets during the day is the Wednesday Morning Ride, which regularly attracts about 15 riders. This ride, which I help to found four years ago and led for three years, is now led by Margie Safran. 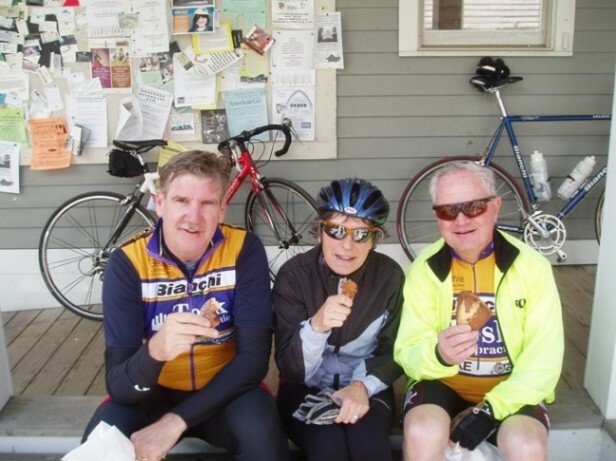 This entry was posted in Berkshire Hills, cycling, The Berkshires. Bookmark the permalink.